The recently launched iMacs from Apple in India are powerhouses of performance and style; here's an in-depth look at their configuration and prices in the market. The new iMacs are available in the screen size of 21.5 inches with 1920x1080 pixel resolution and 27 inches with 2560x1440 of pixel resolution. They have LED-backlit glossy widescreen TFT displays with in-plane switching (IPS) which gives you bright pictures with excellent colour even if you view the display from the sides. The iMacs have a 2.5GHz or 2.7GHz (depending on the model) quad-core Intel Core i5 processor (with 6MB on-chip shared L3 cache) beating at their heart, which can be configured to Intel Core i7 processor with up to 3.4GHz on the high end model. They have 4GB of RAM which can be configured up to 16GB, and a hard disk space of 500GB and 1TB depending on the models which can be further extended up to 2TB in the high end models (all this at a hefty price of course). The graphics card is an AMD Radeon 512MB HD graphics card, which is standard and extends up to 2GB in the costliest model. Apple has also included a FaceTime High Definition camera which can make FaceTime video calls in 720p resolution for better video conversations. All the models have built-in stereo speakers and two internal 17-watt high-efficiency amplifiers plus a built-in microphone and headphone mini-jack. In addition to the regular USB and FireWire 800 ports, Apple has also provided one Thunderbolt port in the 21.5 inch iMac and two ports in the 27 inch model. With the help of the Thunderbolt ports you can move data to and from peripherals up to 20 times faster than with USB 2.0 and up to 12 times faster than with FireWire 800; this will provide data transfer at lightning speeds. "Our customers love the iMac's aluminum enclosure, gorgeous display and all-in-one design, and with next generation quad-core processors, powerful new graphics, Thunderbolt technology and a FaceTime HD camera, we've made the world's best desktop even better." said Philip Schiller, Apple's senior vice president of Worldwide Product Marketing. 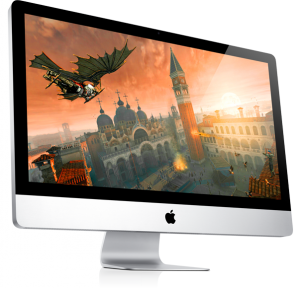 The 21.5 inch models of the iMac are available at a price of Rs. 64,900 and Rs.79,900 while the 27 inch iMac's are available at Rs.91,900 and Rs. 1,07,900 respectively. These prices are inclusive of all taxes. Additionally if you buy your new iMac from the Apple Online Store, you have the option of swapping your Magic Mouse for the Magic Trackpad at no extra cost. There is no doubt that the iMac family is here to stay and with their power and performance, have no doubt become like the Bacchan family of desktop computers in India.